Manchester United midfielder Paul Pogba is reportedly keen to play under former Real Madrid manager Zinedine Zidane at some point in his career. The France international is a similar style of player to the former World Cup-winning playmaker, who has been strongly linked with the United job in recent weeks after a poor start to the new season under Jose Mourinho. CaughtOffside have been told that Zidane has actually already spoken to both Pogba and Anthony Martial about being confident of replacing Mourinho at Man Utd, and it seems this could be a move Pogba would welcome. A club insider claims that the 25-year-old is a big admirer of his fellow Frenchman, though it isn’t made clear if he wants him at Old Trafford in particular, or simply to cross paths at some point in the future. “Paul grew up with Zidane as his hero and would like to play for him at some stage in his career,” the club source is quoted in the Sun. United fans would probably welcome a change in management after Mourinho’s struggles with the Red Devils, with the Portuguese tactician arguably looking a poor fit for the club from day one. 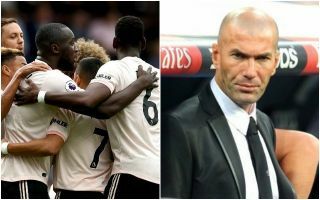 MUFC haven’t really progressed during his reign, whereas Zidane was an instant hit at Real Madrid, winning the Champions League three times in less than three full seasons in charge at the Bernabeu.